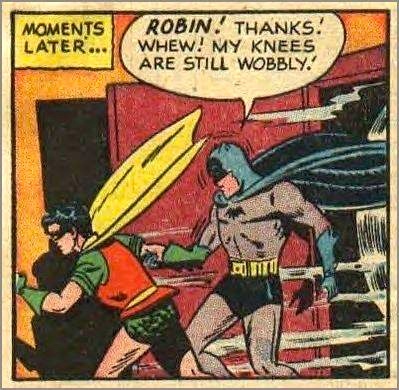 This time we can imagine what the context is, at least roughly: Batman and the Boy Wonder have have just finished a physically taxing mission (which did not involve the Caped Crusader screwing Robin, as this panel might suggest). Still, I thought it would be nice to see how this panel fits into the story, so I ran the image past Google Images — and got tons of hits, all from sites enjoying it as an out-of-context comic panel; these people don’t want the context. In fact, there are collections of out-of-context comic panels on the net, most apparently inspired by one Mitch McConnell, and this drawing is a great favorite. So I never did get the background story. This entry was posted on February 20, 2016 at 4:34 am and is filed under Linguistics in the comics. You can follow any responses to this entry through the RSS 2.0 feed. You can leave a response, or trackback from your own site.